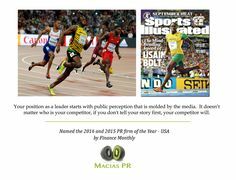 PR Help – The Secrets to Effective Media Placements – PR Newswires – Are they Worth It? The PR newswires are productive outlets when your business is trying to get something on the record. If your business is leading a new frontier, you need to announce it to the world and PR newswires are a productive tool in these cases. In the future, others will see proof that you were first. The backlinks from these PR newswires will also help you with SEO. Recently, a spokesperson with a New York City agency called me and asked what I thought of PR newswires. She told me the City approved funding for press releases with the PR newswires. I used to work with her at CBS, so I threw the question right back at her. But there is a difference when you can get your story on the newswires, like the Associated Press, Bloomberg or Thomson Reuters. This is a huge accomplishment because suddenly your story is now reaching all of the newsrooms (regional or national depending on the story). It’s not easy getting media announcements in the newswires because the news threshold is even higher, but it is possible when you identify a strong news angle. In October 2013, a client had a brilliant survey that had broad appeal. My agency, MaciasPR, pitched the newswires hard on this story and we got it placed. I didn’t even know a newswire picked it up until I saw a newspaper in Idaho run the story. We have also used the “newswires” to get press conferences announced to the local media. Journalists never would have heard of those announcements on the PR newswires. I don’t want to sound like a hypocrite. I have paid to place news releases on the PR newswires for both clients and my own agency, but it was always for the right reason. I either wanted to get something on the record, or I had SEO in mind. Paid press releases with the PR newswires can be an element of a larger media strategy, but if you are thinking of spending the few hundred dollars for the placement, make sure you ask yourself a few questions first to ensure you are pursuing the right strategy. Am I trying to get publicity with journalists? If you are, you will be better pitching them the story individually. If they don’t hear of your idea, they won’t know about it, and chances are they aren’t going to the PR newswires looking for ideas. Do I want to get something on the record? If your company has achieved a major milestone, signed a major client, hit an impressive sales number, etc – a press release on the PR newswires can be extremely helpful in disseminating that message. Do I need exposure for my new website? A paid press release is extremely helpful in these situations because the backlinks will help you instantly with search engine ranking. Finally, if you decide to take the paid PR newswire route, make sure you identify the strongest narrative for your press release and write that headline so it is geared towards the search engines. And if writing is not your strength, hire a professional PR agency to help you with the release. You can always ask me a question via chat at www.MaciasPR.com.